Commander Carl J. Boyd, born on 7 August 1925 in Stuart, OK, received his early education in Galt, CA. 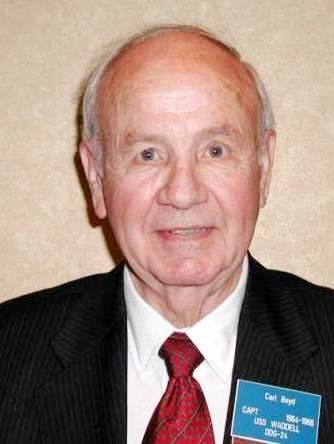 He entered the Navy V-12 Officer College Training Program in June 1943 and attended the Montana School of Mines, Butte, Montana. He was commissioned Ensign, U. S. Naval Reserve on 9 June 1945 after completing Midshipman School at the University of Notre Dame, South Bend, IN. Following graduation he was ordered to the USS John W. Weeks DD-761. He remained in destroyer assignments until 1950 serving in both the Pacific and Atlantic Fleets. Next he attended the U. S. Naval Postgraduate School, Monterey, CA, and graduated in June 1953 with a Master of Science Degree in Electronic Engineering. In 1953 he placed the USS HORNET in commission as Electrical Officer, and in 1955 he placed the USS BOSTON CAG-1, the world’s first guided missile cruiser, in commission as Fire Control Officer. 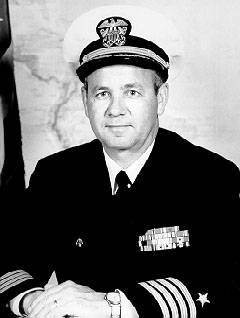 In1956 he was ordered to duty in the Office, Chief of Naval Operations, Surface Warfare Division. In 19?? He was ordered back to destroyers as Executive Officer, USS HANSON DDR-875. In 19?? Commander Boyd was again ordered to new construction as Executive Officer, USS COONTZ DLG-9. Following his tour in COONTZ he attended the U. S. Naval War College. He was again on duty in the Office of the Chief of Naval Operations, Development Program Division, prior to being ordered to USS WADDELL DDG-24. WADDELL is the third guided missile ship that Commander Boyd has commissioned. Commander Boyd is married to the former Mildred McGill, of Brunswick, GA. They have two children: Sharon and Stanley.